If you can tell … | carpe diem! a happy cyclist* by the insects on its teeth, how do you identify a happy knitter? FO: Eunny’s Endpaper Mitts. In Jamieson & Smith Shetland 2-ply. Despite buying Montse Stanley I couldn’t get the tubular cast-on to work for me, so I used my favourite long-tail cast-on instead. I was running low on gold (as one does), so skipped the set-up rows for the tubular cast-off and used the decrease cast-off immediately. End result? I really do like these, in fact I’m wearing them now. They’re my first stranded-knitting ever, and I am happy with the two-yarns-in-left-hand method; I’d recommend anyone (especially continental knitters) give it a fair try. I tensioned the gold as usual on my little finger, but didn’t run it under the second finger, just straight across and down over my index finger. The purple was tensioned on my ring finger and went under the second to run over my index finger. The gold tended to stay on the first joint (nearest my hand), the purple on the second. 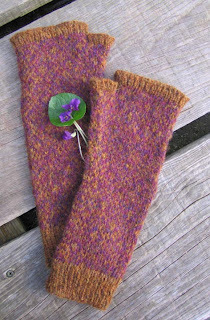 When I make these again (that’s a promise), I will modify the pattern to begin the thumb gusset later, with steeper increases — the pattern as written starts the increases as my wrist shrinks to its narrowest I have very narrow wrists, so there’s a mildly offensive loose bit just there. The rest fits perfectly, is warm and looks gloriously rich in colour. I just wish my stubby fingers and short fingernails lived up to the elegance of the mitts. I think you can identify this happy knitter by its renewed determination to finish the hated Alligator Socks so he can wear them as a token of affection during his three weeks away. Three weeks! I can array the stash in all its glory across the floor and gloat for hours. I can watch DVDs he dislikes (must book some), eat scrambled eggs or baked beans on toast for dinner, have a long hot bath listening to the radio with a glass of wine and a book, sleep anywhere I like in the bed, ok, anywhere the cats allow me space. Yes, I will miss him. I really will. p.s. The wheel should arrive tomorrow. * ‘Happy’ may not be quite the right word. 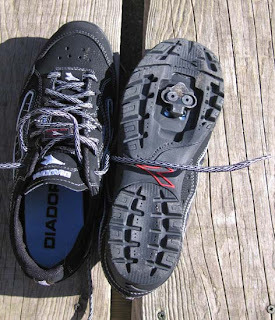 I haven’t cycled happily for ages, not since my then cycling shoes (old trainers) got trapped in my toeclips when I came to an emergency stop. I stopped perfectly, after which my bike with me on it just fell sideways like some cartoon character. Thud. Nothing was damaged except my pride: this was a very public fall. So why have I just switched to cleats? Because I’m like that, that’s why. Mad 🙂 Besides, I want the power! This entry was posted in Uncategorized on March 6, 2007 by sarahw. The mitts are stunning. I am working on some design stuff that I can’t show on the blog, so I will feast my eyes on your knitting splendor. I am a two handed stranded knitter–we’re all different, isn’t it great?I am terrible on a bicycle. I can do it, yes, but I lack good balance. I’ve decided that if I must live somewhere that requires cycling, I will get training wheels or a three wheeler or something!Three weeks is a long time to be away…good thing you’ll have the wheel to keep you company! Sarah,Did I miss something, or did you order a new bicycle?! I am so excited to see your cleats…it just so happens that there is a photo of mine on my blog at the moment, for the Project Spectrum gray color. I am glad to know someone else who is learning how to ride with them too. Good luck, and enjoy your time with the house to yourself. One more thing, there is a cycling knitters group if you would like to join us. Information is at Ride.Knit.Read. I can’t even knit “properly” with one strand, let alone two. I am suitably impressed.I have come close to my toeclips nearly being the end of me but couldn’t imagine riding a bike with bare pedals. Cleats sound like The Business, though.